Our Audi dealership serving Los Angeles, and the surrounding areas of Glendale CA, Alhambra and Arcadia CA, offers a wide selection of new and used Audi models and Audi services, along with a team of welcoming and knowledgeable staff who are ready to offer their assistance throughout each stage of your car buying process. We know that shopping around for the best deal on a vehicle can be stressful, and that's why we introduced our Price Match Guarantee. This not only saves you time and money, but also gives you peace of mind, knowing that no dealer in the Los Angeles area will give you a better deal. And that's exactly how it should be. Learn more about what we have to offer by visiting us in person or contacting an Audi technologist today! 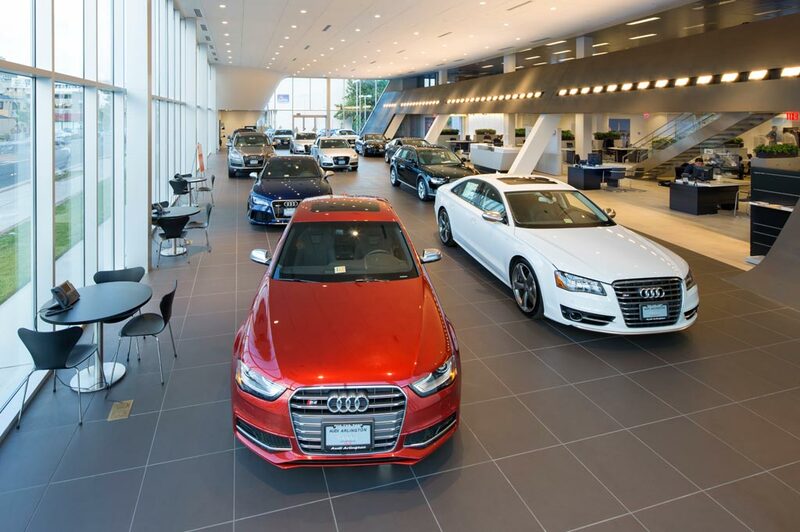 One of the first things that you will notice when visit our showroom is our diverse and pristine selection of new 2018 Audi models, which including the popular Audi Q5, Q7, A3, A3 e-tron, A4 and A6. Browse our inventory online and do all your pre-buy research from the comfort of your home, office, or your favorite coffee shop, and find out which Audi model suits you best. Remember to browse our current lease specials as well as our Manager's featured inventory. If you are interested in buying pre-owned, Rusnak/Pasadena Audi has extensive inventory of used cars in Pasadena CA, near Los Angeles area. Our reliable array of vehicles spans across several auto brands including Audi and many more, so you're sure to find a the right match. We carry certified pre-owned inventory, as well as service loaner inventory. Our friendly staff is well-versed in helping drivers of all financial abilities discover the best car loan and lease options available. Whether you're a first time car-buyer, or you have years of experience under your belt, Rusnak/Pasadena Audi can help all Los Angeles, Glendale CA, Alhambra and Arcadia CA drivers achieve the ideal auto financing options. That means you can focus about what's really important: that shiny new or pre-owned vehicle. When you've driven home in your new Audi or pre-owned vehicle, your relationship with Rusnak/Pasadena Audi doesn't have to end. Our team remains committed to you and your vehicle by offering an Audi service and Audi parts center to help keep maintain your auto investment. Use our online form to schedule service, or order car parts. Remember to see what savings are available by checking our service specials and car parts specials. Of course, it's one thing to brag about everything Rusnak/Pasadena Audi has to offer drivers from Los Angeles, Glendale CA, Alhambra and Arcadia CA; it's something completely different to actually show you ourselves. That's why we invite you to see us in person at 267 West Colorado Boulevard Pasadena, California today. To stay up to date on the latest Audi news, visit our blog! California Audi Dealer Selling New Audi and Used Luxury Cars. Serving: Pasadena, CA, Los Angeles, CA, Glendale, CA, Alhambra, CA, and Arcadia, CA. Our Audi dealership serving Los Angeles, and the surrounding areas of Glendale, Alhambra, and Arcadia CA, offers a wide selection of new and used Audi models and Audi services, along with a team of welcoming and knowledgeable staff who are ready to offer their assistance throughout each stage of your car buying process. We know that shopping around for the best deal on a vehicle can be stressful, and that's why we introduced our Price Match Guarantee. This not only saves you time and money, but also gives you peace of mind, knowing that no dealer in the Los Angeles area will give you a better deal. And that's exactly how it should be. Learn more about what we have to offer by visiting us in person or contacting an Audi technologist today! One of the first things that you will notice when visit our showroom is our diverse and pristine selection of new 2018 Audi models, which includes the popular Audi Q5, Q7, A3, A3 e-tron, A4 and A6. Browse our inventory online and do all your pre-buy research from the comfort of your home, office, or your favorite coffee shop, and find out which Audi model suits you best. Remember to browse our current lease specials as well as our Manager's featured inventory. If you are interested in buying pre-owned, Rusnak/Pasadena Audi has extensive inventory of used cars in Pasadena CA, near the Los Angeles area. Our reliable array of vehicles spans across several auto brands including Audi and many more, so you're sure to find a the right match. We carry certified pre-owned inventory, as well as service loaner inventory. When you've driven home in your new Audi or pre-owned vehicle, your relationship with Rusnak/Pasadena Audi doesn't have to end. Our team remains committed to you and your vehicle by offering an Audi service and Audi parts center to help maintain your auto investment. Use our online form to schedule service, or order car parts. Remember to see what savings are available by checking our service specials and car parts specials.